Now I need to sleep. Because in Turkey currently hour is 01:05 AM. Ran the DE2.exe and it displays the correct time. Unfortunately i can't run it against TimeSyncClock, cause it complains that geobytes site would not be responding (Error 1), eventhough the site works fine in my browser. How can it be ? It wrong adjusts the system clock but it shows the correct time. Very very interesting! Your Geo+.exe detects Country Code 'TR' for some reason. Opps! But this is impossible for me. I can't accept it. I guess you're right. So I'll have to study the problem. What a relief! My head started to hurt from all that pounding with the chair. I think I managed this time. Please run GEO+.exe and please tell me it works this time. Did you figure out, why it detected always TR before? I forgot the code in the line of the AutoIt. Therefore equality and the cycle is broken. Namely I made a stupidly mistake. But I added a new feature (/WTD+) to the program now. Fisrtly let me congratulate you Max. TimeSyncClock works very well now. Thank you! But a question bugs me. You use the country code to find the correct timezone, what happens in countries which have multiple timezones, like the USA, Australia, Russia, China? Last but not least, there is one little thing, which would make your program perfect. 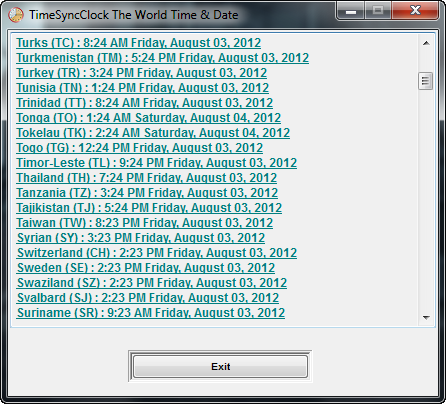 If it would be possible to set the Windows timezone acording to the online findings before correcting the clock. Paraglider mentioned somewhere above, that NTFS uses GMT instead of local time for filestamps. If necessary to give an example for the united states. I took base this country's capital city as the Russia 's moskow city. Would be very troublesome for me to show all the state time zones. But I had also predicted in advance this question. So If you wish; and if you know the state code of country, you can use this code as an example. Don't know which information excatly you need. Timezone informations are set with SetTimeZoneInformation. Since i havn't found any source or sources, which would provide all timezone informations under any kind of circumstances, we might need to settle for less and skip the daylight switching settings. btw. 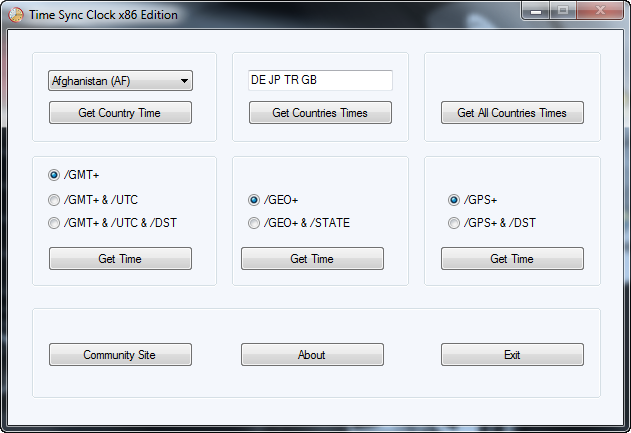 Found a nice site, which detects ones location and gives local time all in one page. Switching to a second page gives more extended timezone information. Scroll down to 'References' there you find a collection of links to everything timezone related. From databases to converting values. timeanddate.com works with cities instead of countries/states. One can eighter use the sites own detection or provide the city name. Time Sync Clock v1.8 is ready ! The new version has a lot of problems. /GMT+ &/UTC does work though as expected. Though i'm not a big fan of simply deleting the timezone settings. /GPS+ and /GPS+ &/DST give the same value. 'Get County Time' gives time in anglo-american style with AM and PM instead of using the time display settings of windows. 'Get County Times'(both) open a display window, which can not be closed by using the window close button. Only the Exit button works. /GEO+ works fine and /GEO+ &/STATE couldn't be tested. The 'About' button gets deactivated after first use. 'Community Site' gives an error that Windows can't find 'www.reboot.pro/17222/' in PE. btw. Not a big fan of the changing cursor feature. Especialy the stop sign over the exit button, this send me searching for another way to exit the program, since this button is marked as non-functional. It is not for me. Because this is a problem about with the www.earthtools.org completely. I know. But the settings are backed up in this registry key. So if you select the /GMT+, the settings will be restored by this reg-keys. Also there are so many options. And you can use any one. This applies to all keys that are already in the main menu. I do not see anything wrong with that. 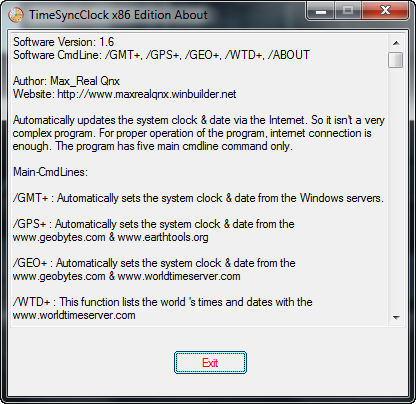 The command for setting the time based on geographical position is working (GUI and command "timesyncclock-x64.exe /GEO+ /SILENT). Any ideas for fixing this?